Debbie Jefkin-Elnekave is a travel photographer, writer and experienced tour leader who specializes in remote regions of the world. She has criss-crossed the globe many times, photographing and writing about exotic cultures of Asia, Africa and Latin America. Her popularity as a tour leader is the result of her attention to detail, knowledge of and appreciation for the cultures she visits, and her ease in connecting with indigenous people and their life ways. 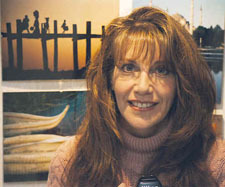 Debbie is also the owner of Uncommon Images, a stock agency specializing in travel photography. A partial list of her corporate clients includes IKEA, Asia Transpacific Journeys, Mountain Travel Sobek, The Rotarian Magazine, Snow Lion Expeditions, Wilderness Travel, Artisans of the World, Cedco Publishing, Crabtree Publishing, Houghton Mifflin Publishers, New World Outlook, Scholastic Magazine, and Transitions Abroad. Debbie's travel and photo essays have been published by the Journal of The Photographic Society of America (PSA), ASEAN Travel Magazine, Things Asian and Outdoor Photography Magazine. She is the recipient of PSA's prestigious Elmore Chatham Memorial Award for the best feature article of 2004. When Debbie is not on tour, she pursues her life-long passion of humanitarian service by volunteering as a translator and photojournalist on medical missions to Guatemala, Bolivia, Peru and China. The sun sets behind a distant ridge, day fades into indigo-tinted dusk, and the city reveals itself in a million twinkling lights, shimmering and dreamlike, mesmerizing and surreal. For an all too brief, magical moment, La Paz lies silent, except for a wonderfully beautiful, memory evoking melody of a pan flute, which lingers for an instant, then vanishes into night. Many devotees maintain an all night vigil to honor the tabot. Their chanting continues throughout, and wakes us up at intervals. It is a soothing chant, of this devout congregation softly calling out for God's blessing, like rippling water along a riverbank. We wake up in the morning feeling renewed, in spite of, or perhaps because of, the interludes. The rustic strains of two drums and a hand-made wooden flute hang in the air in a hypnotic refrain that can only be described as indigenous. Something extraordinary is clearly about to unfold as dozens of women materialize, seemingly out of nowhere. They link arms in a vigorous choreography of their native dance, which appears to me as an endless rendition of hava nagila on steroids. The women invite me to join in my own two-left-footed version of the dance. But this is more than just an afternoon of entertainment. It is evidence of the unshakable foundation of their deep cultural heritage. The lake lies silent, motionless, and the encircling Shan mountains are visible only as a shadowy, serrated rim through the early morning mist. An hour passes in absolute, tranquil, meditative solitude. Then gradually, almost imperceptibly at first, the sunrise begins to transform the reverie, and a magical sight slowly unfolds. Among the "rush hour" commuters silhouetted against the persimmon and amethyst sky are monks, fishermen, vendors, and those who come simply to behold the breathtaking sunset. As an unparalleled beauty gradually unfolds, I begin to understand the allure. Dusk falls on the U-Bein Bridge with the gentleness of a calm whisper, and the all-embracing serenity reminds me how everyday cares fade away in the presence of nature's gifts. The spindle-topped stupas of the village pagoda loom in the background as oxen graze nearby. Men crouched in their ox-drawn carts move slowly along. People bathe and wash clothes, unfazed by the frigid temperatures of the air and water. Straight-backed women toting water pots on their heads walk so gracefully along, they appear to float across the landscape. The scent of cooking fires and the sound of pagoda bells hang in the air. This is the way it has been for as long as the centuries old banyan trees have stood here, and the way it will be forever, sunshine or monsoons, peace or war, democracy or socialism. Nothing upsets the timeless rhythm of daily life in Pindaya. As I reflect on these images in the scorching midday sun, I take comfort in this fortress of tradition, where the people are infinitely friendly and open, yet thankfully, resistant to modern world intrusions. My thoughts are now accompanied by a monk's prayerful chanting. In his mantra I am sure I can hear the echoes of Bagan's ancient pilgrims, who have bequeathed us this sanctuary of grace, tranquility and spirituality. Although Dr. Chang modestly dismisses the notion that he is a miracle worker, when he entered the operating room this afternoon, a miracle happened. After seeing his son for the first time after surgery, the look on Segundino's face twists our hearts into knots. No words are spoken. None are needed. The gratitude in his eyes speaks volumes. Alejandrina's eyes light up when the doctor pronounces Jose Guillermo eligible for surgery, as if these words hold the answer to her most fervent prayers. But as she hands her baby to the surgical team, the look of anguish on her face is so poignant that it makes time stand still. It is an act of blind faith to entrust a loved one to strangers. It is hope amidst desperation. Courage amidst fear. Appropriately, "Somewhere Over the Rainbow" plays in the operating room.